Calming, spiritual sounds from South L.A.'s 84-year-old Rev. Raymond Branch; includes a new interpretation of Lou Reed's "Jesus," originally recorded by the Velvet Underground. An 85-year-old preacher covering the Velvet Underground? Believe it. But then, Rev. Branch is no ordinary minister. Born in 1931 on Bayou Black, Louisiana, Rev. Raymond Branch followed his calling to Los Angeles, where he debuted the Rainbow Gospel Hour in 1971, buying late-night airtime on Inglewood’s KTYM-AM with earnings from his trade as a barber. A historic 40-year run of the self-financed, self-produced program ended without fanfare in 2014, but at 85, Rev. Branch’s commitment to charity and uplift continues. He keeps daily hours serving the community from the Heavenly Rainbow Baptist Church in South Los Angeles, where all are welcome. Though Rev. Branch released a handful of now-rare singles as "Ray Branch and His Guitar" decades ago, I'VE GOT HEAVEN ON MY MIND is his first full-length release. It includes a new interpretation of "Jesus," composed by Lou Reed and originally recorded by The Velvet Underground in 1967. RevBranch.com is his online archive. You don't have to go to church to let Reverend Branch take you to church. I'm not particularly religious, but this CD is so beautiful and filled with love. Reverend Branch is a true believer. His love for Jesus overflows on this recording. The songs are beautifully performed and recorded. Perfect for a weekend morning. There's nothing like Reverend Branch in this world. Back in the 1960's-1980's, I often listened to raw, downhome Gospel music on low-wattage AM radio stations from both black and white artists/groups. Often, a minister would both preach AND sing, and there was a raw and spontaneous and heartfelt quality to that music which cannot be faked and which is moving on a deep level. Reverend Raymond Branch's new album brings back that rich heartfelt spirit. 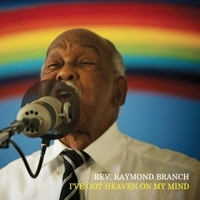 A legend in Los Angeles radio for his longtime broadcasts from the Heavenly Rainbow Baptist Church, Reverend Branch has made an album that's full of depth and life-experience and wisdom. He's in his 80's, but if you have enjoyed recent Bob Dylan recordings of late period Louis Armstrong, you should not have a problem with the Reverend's gravelly, lived-in voice. It's a voice of experience and a welcoming voice. While he played the guitar in the past, presently he is accompanying himself on the Omnichord and Qchord, instruments which are described as being in the autoharp family. The sound the instruments create is haunting....If you can imagine a keyboard set-up for a minute, imagine that the left hand produces pillowy chords which anchor the songs and suggest their chord progression, while the the right hand does these beautiful and fascinating filligrees which circle and dialogue with the vocals. The album seems to exist in a transcendent state, the kind of deep and exalted state found in worship or prayer, and Reverend Branch has created a beautiful album that extends his ministry. One of the other reviews has called this album "field recordings from heaven," and I'd have to agree with that. This is raw Gospel from the heart and has an "outside" quality which is refreshing....it's nothing like the slick, sanitized Gospel one hears so much on the radio and in concert nowadays. If you are looking for a timeless Gospel experience from a man whose voice drips with wisdom and life experience and who truly reflects the love of The Lord toward us all, then you'll be as excited about this new album from Reverend Raymond Branch as I am. Truly, an original! Wonderful music without the thick caking of production shenanigans that diminishes so much of today's music. It's an "original music" in the sense it comes first from a place of passion and a need to share the message of Jesus Christ, not from a board room of music executives plotting their next sales coup. Recommended for all lovers of music and Jesus Christ.